The Fourteenth Hole is a dog leg right. Longer hitters will want to avoid hitting a driver off the tee to avoid the risk of driving through the fairway to the left. Trying to hit a long drive along the right tree line also normally ends up poorly as the dog leg turns late. 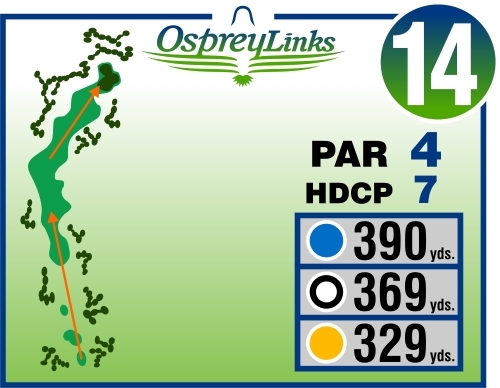 Best to hit a long fairway wood and get to the 150 yard fairway marker for a flat lie for your second shot. This placement also renders a good look at the green that is nestled into the woods and defended by a large bunker.